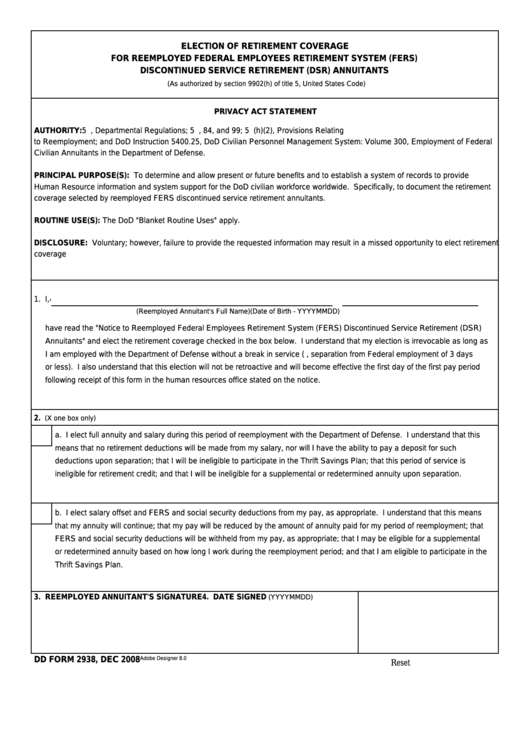 Download a blank fillable Dd Form 2938 - Election Of Retirement Coverage For Reemployed Federal Employees Retirement System (Fers) Discontinued Service Retirement (Dsr) Annuitants in PDF format just by clicking the "DOWNLOAD PDF" button. Complete Dd Form 2938 - Election Of Retirement Coverage For Reemployed Federal Employees Retirement System (Fers) Discontinued Service Retirement (Dsr) Annuitants with your personal data - all interactive fields are highlighted in places where you should type, access drop-down lists or select multiple-choice options. Civilian Annuitants in the Department of Defense. coverage selected by reemployed FERS discontinued service retirement annuitants. following receipt of this form in the human resources office stated on the notice. ineligible for retirement credit; and that I will be ineligible for a supplemental or redetermined annuity upon separation.